Description: Russia. Early map predominantly detailing Russia in Europe. Strong impression. Published as part of Hakluytus Posthomous or Purchas his Pilgrimis, contayning a History of the World in Sea Voyages and Lande Travells, by Englishmen and others. Description: Russian Empire. Restoration at foot of fold. Original colour. 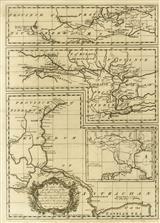 Description: Four route maps following the River Volga to accompany the explorative works of Jonas Hanway as he travelled through central Russia. Description: Map marking the success of the Orenburgh Expedition to accompany the explorative works of Jonas Hanway as he travelled through central Russia. Description: Interesting map of Siberia based on the survey of de L'Isle which was published in his Atlas Russicus. Coloured. 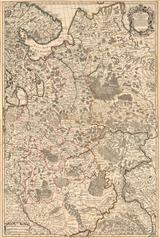 Description: This map of the Empire of Russia on two sheets joined shows the full extent of its geography after the claims and victories of Catherine the Great. Original hand colour. Description: Russia across Europe and Asia, mapped with a discovery of 1723, land in the East Siberian Sea. Coloured. Description: Russia shown with its full possesssions from northeast Asia, through Siberia, Central Asia and then to the Baltic States. Coloured. Description: Charming miniature map with original outline colour. Description: Russia. Elegant copper-engraved map. Coloured. Description: Early 19th century map showing the full extent of the Russian Empire just before their defeat of Napoleon. Coloured.